The current medical practice is evidence based. The use of evidence-based guidelines in the management of medical conditions can result in harmonisation among care providers with regard to diagnosis, and selection of therapeutic products to treat haemophilia. These guidelines are designed to fit the needs and special conditions of patients in Saudi Arabia, and include details of the therapeutic products available in Saudi Arabia. Cord blood (CB) is the blood that remains in the placenta and umbilical cord after a baby is born. It is a rich source of stem cells, which may cure life-threatening diseases such as leukaemia, myelodysplastic syndromes, bone marrow failure syndromes, hereditary immunodeficiency states, and metabolic disorders.1 The first cord blood transplant was performed in 1988 in France, in a child with Fanconi anaemia. The cord blood was collected from the child's sibling at birth. The patient is alive and well to this day. Cord blood is easy to collect and there is no risk to baby or mother. It is ready to use, as it is stored. Mandatory testing is performed prior to storage with potential to expand the effective donor pool with a tolerance of 0-2 HLA antigen mismatches and by targeting specific ethnic groups who are underrepresented in bone marrow donor panels. The incidence and severity of Graft Versus Host Disease (GVHD) is low, because the immune cells are naοve and less mature, and present a low risk for transmission of infections by latent viruses such as Cytomegalovirus (CMV), with an incidence in newborns of less than 1%. Some disadvantages of cord blood transplantation include the relatively small number of harvested stem cells, limiting their utility in adults; a low number of CD34+ cells in each cord blood unit (CBU) results in delayed engraftment and increased risk of infection; in addition, patients might be exposed to rare genetic disorders that are not detected during laboratory testing; finally, cord blood is a limited source and unavailable for top-up or for use in donor lymphocyte infusions (DLI), if required. In addition, cord blood collection may not be advisable or possible if the baby is premature or if the mother is multigravid, has had an emergency caesarean section, and/or certain maternal medications or positive markers for transmissible infections are present. Anemia is very common in critically ill patients and is usually treated with blood transfusions. The aim of this study was to determine the prevalence of anemia, transfusion rate and practice in the intensive care unit (ICU). This prospective cohort study was carried out in a medical-surgical ICU of a tertiary referral hospital. Patients admitted to the ICU for >48 hours were included. The following were documented: patient demographic data and ICU admission diagnosis; baseline haemoglobin (Hb), platelet count, prothrombin time, partial thromboplastin time, creatinine level, urea level, alanine aminotransferase level, and bilirubin level; and Acute Physiology and Chronic Health Evaluation II and Sequential Organ Failure Assessment scores. Daily Hb levels were collected. Overall, 449 patients were included in the study (mean age, 46.5 years; range, 14-94 years). Most patients (64.4% men and 69.9% women) were anemic on ICU admission and 83.4% patients were anemic during their ICU stay. Approximately one-third (32%) patients developed thrombocytopenia. Sepsis was the most common admission diagnosis. Most patients had central venous catheters (92.4%) or mechanical ventilation (81.1%). ICU and hospital mortality were 12.2% and 19.2%, respectively. Half (49.9%) the study population received at least 1 transfusion consisting of an average of 2 units of packed red blood cells. Logistic regression analysis showed that transfusion is associated with increased ICU (P<.0001) and hospital mortality (P=.0004). The anemia prevalence and the transfusion rate in our population were very high. The current transfusion practice definitely warrants improvement. Idiopathic (immune) thrombocytopenic purpura (ITP) is the most common haemorrhagic disease in children. As the outcome of ITP is not well known in the United Arab Emirates population, the aim of this study is to analyse presenting symptoms, signs, laboratory findings, and response to therapy to assess the natural history of ITP treated at our centre. A retrospective review of 153 patients treated for ITP at the Tawam Hospital between September 1999 and January 2006 was carried out. Patient ages ranged from 2 months to 10 years. The work-up to confirm the diagnosis included coagulation studies to screen for von Willebrand type 2 disease, autoimmune screenings for the antinuclear antibody and C3, and bone marrow studies to rule out other serious haematological conditions. Of the 153 patients, 110 (72%) achieved complete remission and their platelet count remained above 100,000. Overall, 22 (14.3%) patients had refractory disease and 21 (13.7%) developed chronic ITP. Majority of our patients (72%) achieved remission and maintained a platelet count >100,000. Twenty-two patients (14.3%) required more than 1 intervention and eventually recovered, while the remaining 21 (13.7%) developed chronic ITP. To determine the status of the cochlea, auditory pathway, and hearing threshold in patients with sickle cell disease, we recorded brainstem auditory-evoked potential (BSAEP) and performed electrocochleography (ECOG). This observational study was performed in the Department of Clinical Physiology at our hospital from January 2002 to November 2009. We studied patients diagnosed with sickle cell disease and having varying degrees of hearing impairment. BSAEP and ECOG data were recorded according to standard protocols. We observed 3 result categories. Group I (n=5) had a moderate increase in hearing threshold. Group II (n=8) at 80 dB had increased I-V interpeak latency and increased III-V interpeak latency with normal electrocochleographic data and a significantly high hearing threshold. In group III (n=1), only a delayed wave V was present at 80 dB and the electrocochlear response was absent. Most cases of sickle cell disease were associated with varying degrees of hearing impairment with increased hearing threshold and predominantly retrocochlear involvement. Iron deficiency anaemia (IDA) is one of the most common causes of anaemia, affecting one-third of the world population. Due to decreased synthesis of haemoglobin, the level of HbA2 in IDA is decreased. The aim of this study was to evaluate which Hb levels decrease in IDA to cause significant laboratory findings of reduced HbA2. The levels of ferritin, HbA2, and haematologic parameters were measured in 202 IDA cases (65 male and 135 female; mean age: 28΁8 years). All subjects were referred to the Valfajr Medical Centre in Shiraz for the premarital screening program. After 2 months iron therapy, the parameters were re-evaluated by the same standard methods. Clinical presentation of IDA including low appetite was present in all cases with Hb <10 g/dL. Numbness of the extremities was present in 88%, pica in 95%, and splenomegaly in 2%. Mean HbA2 level in cases with Hb <10 g/dl was 1.1-1.99% and in those with Hb between 10-13.9 g/dl was 2-3.4%. Before iron therapy, the mean levels of HbA2 were 2.5% and 2.1% in men and women, respectively. After iron therapy, both groups showed increased levels of HbA2 (about 3%). There was a positive correlation between iron therapy and the level of HbA2 (P<.05). There was no correlation between mild IDA and changing HbA2, but the HbA2 level was reduced in moderate to severe IDA. Due to the biological heterogenecity of lupus anticoagulant (LA) antibodies and the relationship of LA to other phospholipid-dependent antibodies, the diagnosis of LA is quite complicated. No one test is capable of detecting the LA antibodies. The International Society for Thrombosis and Haemostasis (ISTH) scientific and standardization sub-committee have formulated a set of recommendations for LA testing. At King Faisal Specialist Hospital and Research Centre (KFSH & RC), the hematology laboratory used to test for LA by Dilute Russel Viper Venom Time (dRVVT), both screening and confirmation. We tested 60 patient samples by using 2 different reagents, LA1/LA2 (dRVVT) and PTT-LA/Staclot LA. These patients were not on warfarin. Out of 60 patients, 26 were positive by both dRVVT and PTT-LA/Staclot LA, 4 were positive by dRVVT only and 9 were positive by PTT-LA/Staclot LA only. In a side work, we also found out that warfarin was interfering with the dRVVT testing by giving false positive results. In this small validation study we confirm here that the detection rate of LA increased by performing more clotting assays with different principles. We also confirmed that dRVVT is not an appropriate test for patients on warfarin. Non-immune haemolysis is a rare manifestation of acute leukaemia. Here, we report a case of non-immune and non-fragmentation haemolysis as the initial presenting manifestation in a 20-year-old man with acute myeloid leukaemia (AML-M6). All other potential aetiologies of haemolysis were excluded, including drugs, paroxysmal nocturnal haemoglobinuria, and immune and other known congenital and acquired causes of haemolytic anaemia. 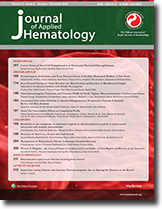 Published laboratory data showed that erythroleukaemia with haemolysis can be induced in murine animal models using a murine leukaemia virus. A relationship between this laboratory data and the possible pathogenic virus infecting this patient could not be proven. Haemolysis resolved with leukaemia treatment in this patient. This case shows that malignant haematopoietic disorders should be considered in patients with newly diagnosed haemolysis.